You’ll find big hair, boots, wide open spaces and most importantly: barbecue. Austin is home to some of the best barbecue in the country. 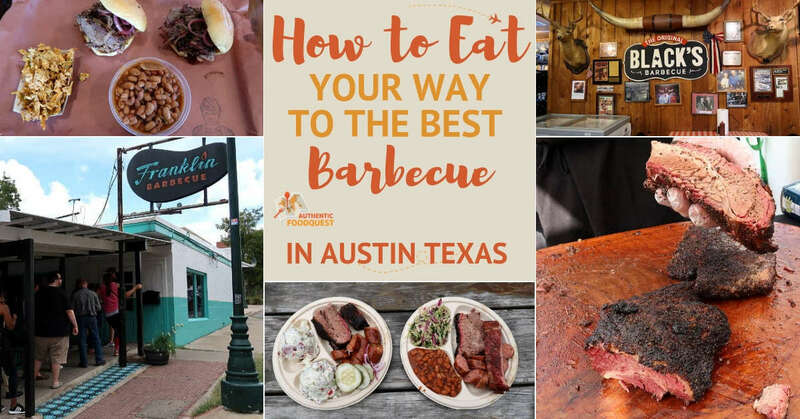 From internationally renowned joints like Franklin barbecue to local barbecue trailers and eateries, the selection is vast. 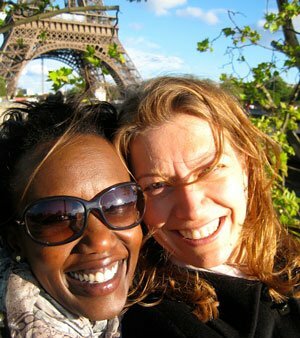 When we learned TravelCon, a travel media conference was in Austin, we were sold. This was our opportunity to delve into the local barbecue scene. We made it a point to extend our stay beyond the conference and found a one month house sit on the north side of town. 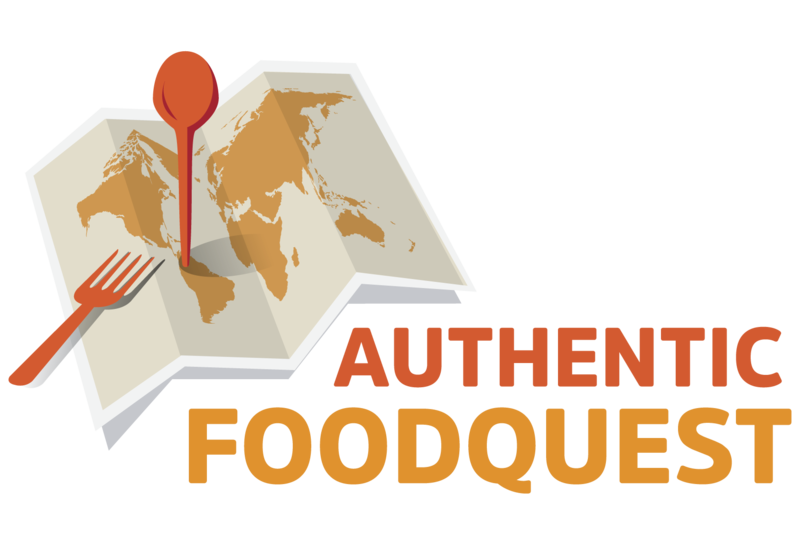 Our goal at Authentic Food Quest, is to explore and showcase the local flavors of a destination. While preparing for our month stay, we asked a number of Austinites to share their secrets and tell us their favorite barbecue joints. With their recommendations in hand, we set out on a quest to discover the best barbecue in Austin. 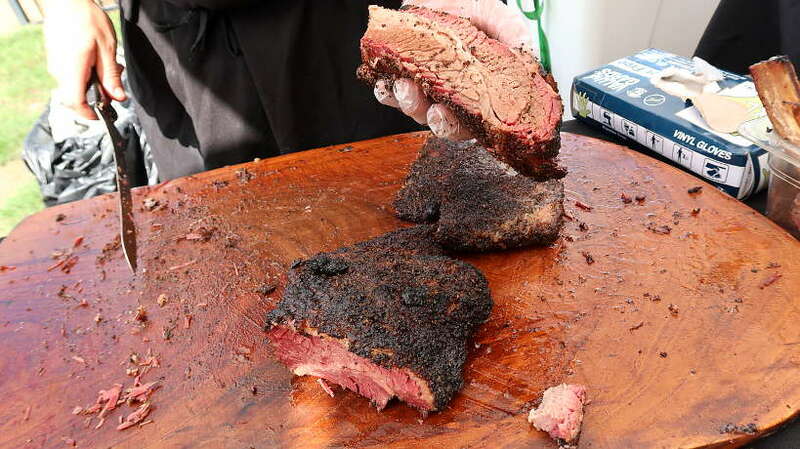 What Makes Texas Barbecue in Austin so Special? 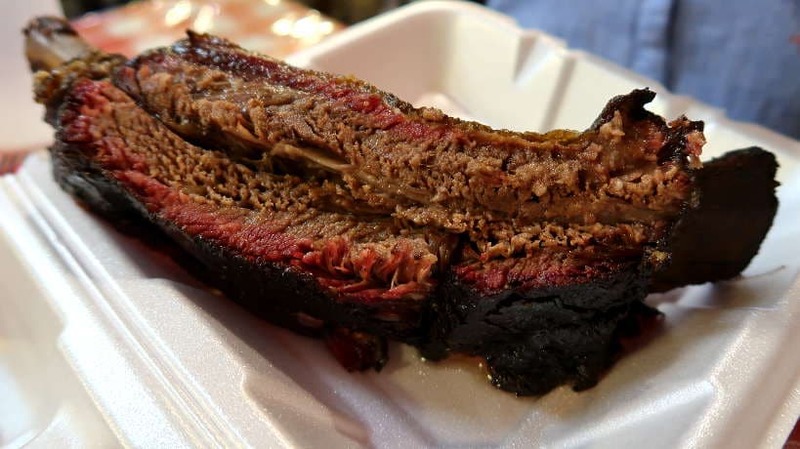 Where Does Central Texas Barbecue Tradition Come From? Does Franklin Barbecue Live Up to Its Reputation? When getting ready for our quest for the best Texas barbecue in Austin, we learned about the barbecue style. The Central Texas barbecue style. 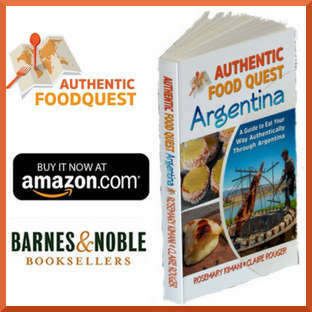 Not only it is the most popular way of making barbecue in Texas but its popularity has also spread around the world. 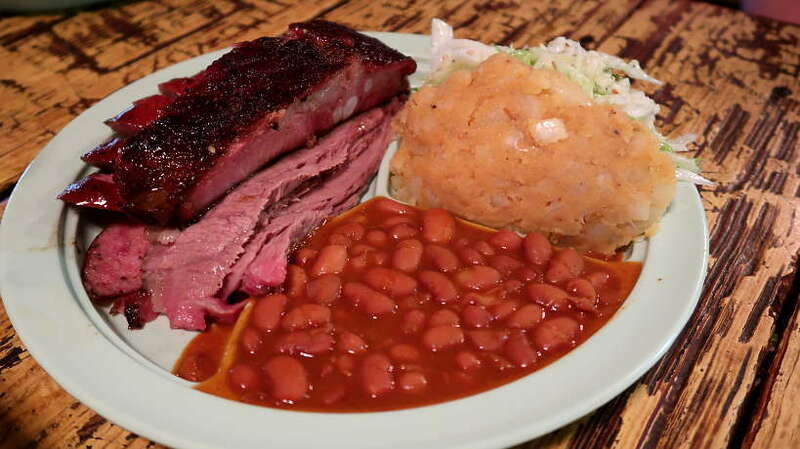 With the Central Texas barbecue style, the emphasis on the meat, the key ingredient. The meat is prepared in a simple fashion with salt and pepper and then smoked for hours in a pit. The sauce is secondary. This is exactly how we like our food – simply prepared with a focus on the raw ingredients! Making the best Central Texas Barbecue is an art. From cutting the meat to the delicate preparation to smoking the meat to perfection and finally serving it. Each and every step takes patience and long hours of cooking and testing. 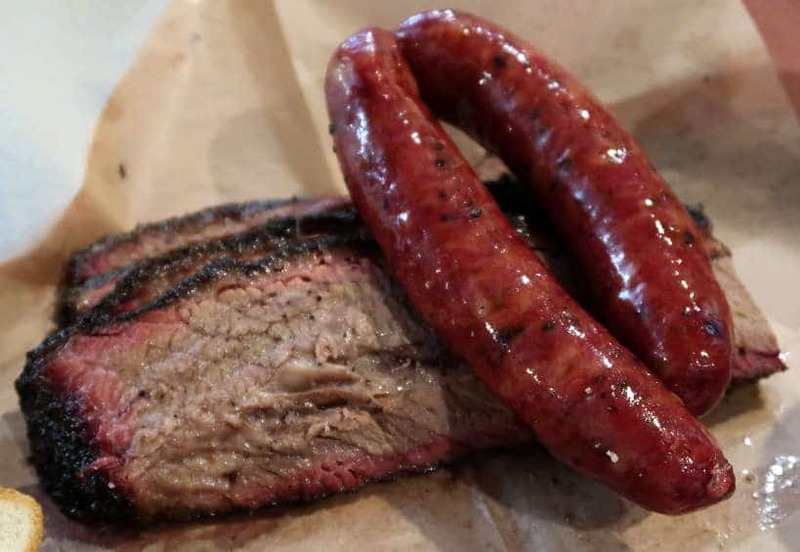 Back in the 19th century, German and Czech settlers brought the European meat-smoking tradition to Texas. At first, unsold meat was smoked by butchers to preserve it. Shortly after, the leftover smoked meats became so popular that eventually, the butchers turned their focus to becoming restaurants and barbecue joints. Butcher’s paper, used originally to wrap raw meat, doubled as wrapping for the cooked pieces. 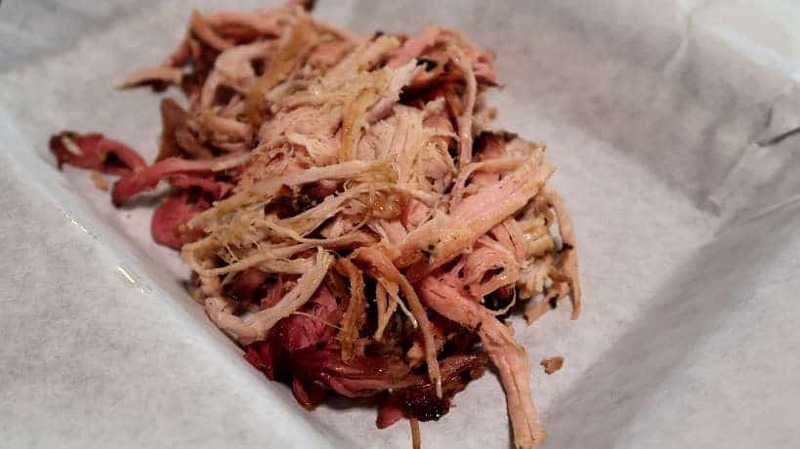 Today, barbecue, usually purchased by the pound, is served on trays lined with butcher paper as a symbol for “authentic barbecue”. 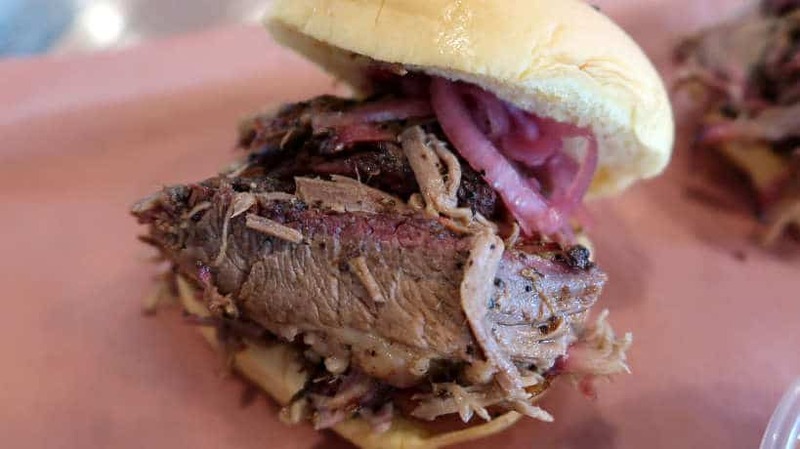 Texas barbecue restaurants are thriving, with many places competing for the best traditional smoked meat in town. Franklin Barbecue in Austin was among the first on our list to check out on our quest for the best barbecue in Texas. Named the #1 barbecue restaurant in the world, it was no wonder the name came up consistently whenever we asked locals. 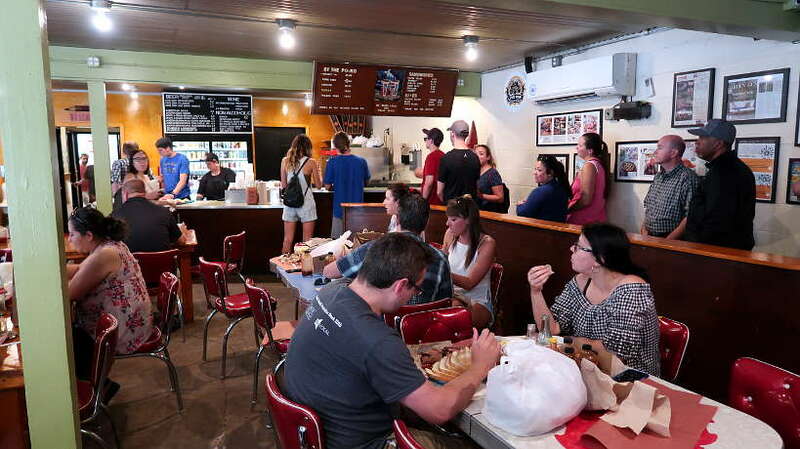 With its popularity, tasting Franklin barbecue can be quite challenging. People queue for hours, up to 6 hours, to taste Franklin’s famous brisket, ribs, and sausages. Waiting in line for hours, however, wasn’t what we envisioned for this quest. Though, we could not miss tasting the best barbecue in Austin that had seduced Anthony Bourdain and President Obama. Armed with a helpful hint from a local to cut the line by going for a late lunch between 1:00 pm- 2:00 pm, we decided to go to Franklin’s barbecue the day after Labor Day. Our reasoning was that people would have had their fill of barbecue over the long Labor Day weekend. That tactic paid off. Even though there was a line when we went to Franklin’s Barbecue, we only waited for 40 minutes. Though, there was a trade-off. A late lunch means you’re at risk of the place selling out of some items. On that Tuesday, they sold out of the ribs even before we got to the door. However, there was plenty of brisket and sausages waiting for us. Enough to satisfy our quest for the best barbecue in Austin. To accompany the half-pound of brisket and sausage link, we chose a serving of coleslaw, pinto beans, and potato salad. These are typical Texas sides that go with the meats. Was it because of the time we spent waiting and salivating or simply because of the positive reviews? In the end, we thought Franklin’s Barbecue lived up to its reputation. The brisket perfectly seasoned melts in the mouth. The sausage was juicy, slightly crackling, and with a nice balance of fat and meat. When we originally ordered, we asked for the lean brisket. The server, knowing what was best, had us taste both the lean and fatty versions. Our preference actually went to the fatty brisket. The fat added moisture and tenderness, making the meat even more desirable. Local Austin draft beer completed the experience. Barbecue aficionados will enjoy Aaron Franklin’s book, “Franklin Barbecue: a meat-smoking manifesto.” He shares the nitty-gritty of his own barbecue process and how he become the most celebrated pit master. Address: 900 E 11th St, Austin, TX. It was an adventure getting to la Barbecue. When we set out for the day, our original plan was to check out Franklin’s barbecue, with Micklethwait Barbecue as a backup plan. It was about 2:40 pm when we drove by and it was clear by the “sold out sign”, it was too late. 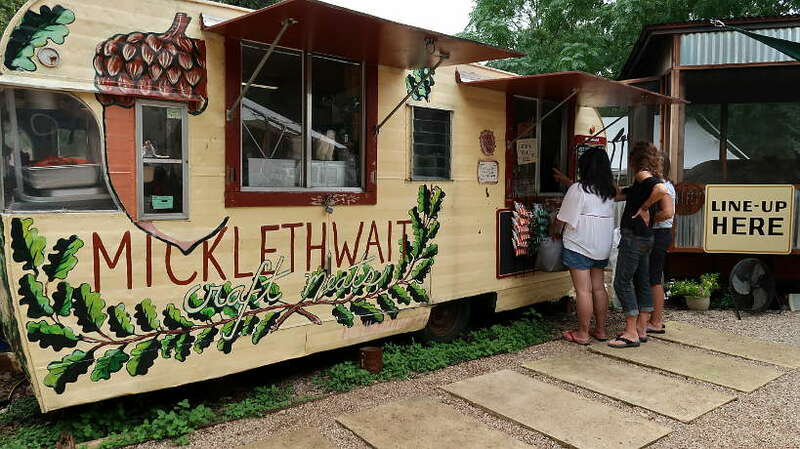 Micklethwait Barbecue, in the same area that Claire nicknamed “the barbecue row”, was a short drive from Franklin. While the hours indicate a 6:00 pm closing, the “sold out” sign told another story. That’s when we decided to take our chance at la Barbecue. We pulled up into the empty parking lot, as smoke billowing out of the pit welcomed us. With a bright and sleek decor, la Barbecue stands apart from other barbecue places. 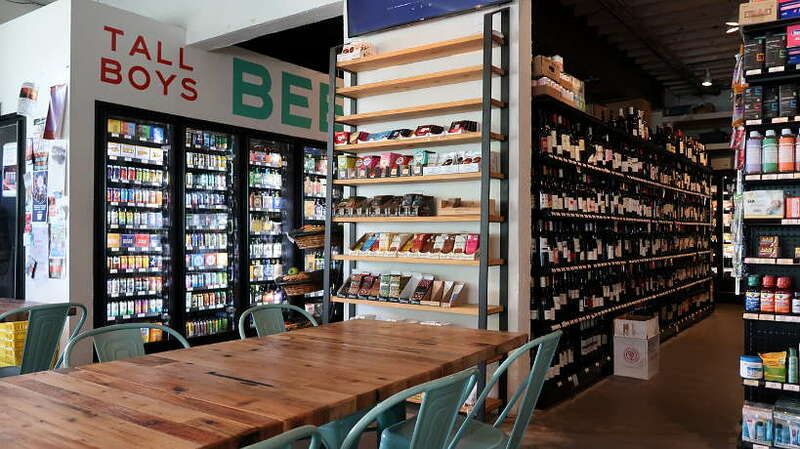 Adjoining the modern counter where you order your food and drinks is a gourmet deli store. We learned that la Barbecue is owned by LeAnn Mueller, daughter of Bobby Mueller from the legendary Mueller Barbecue. 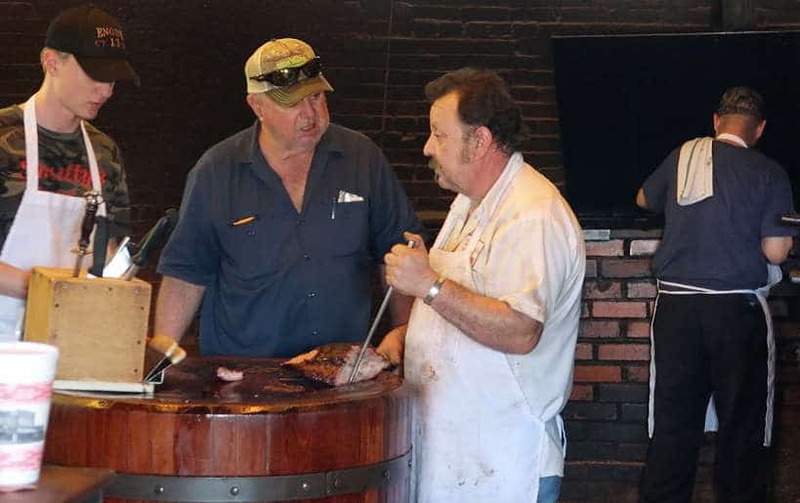 Mueller Barbecue has been named the “Best BBQ in Texas” and Bobby was a James Beard Award Recipient. LeAnn continues the German tradition of handcrafted meat with a modern twist. We love LeAnn and her partner’s commitment to offering the highest quality local meats, free of hormones and sweet stuff. Amen! Not yet accustomed to ordering “meat by the pound”, our attention was captivated by the appetizing and significant sandwich menu. El Sancho Loco sandwiches sounded like the best option to taste beef, pork, and sausage all at once. Topped with pickled red onions and served in a Martin’s Potato Bun, this sandwich was to die for. Our favorite meat was the chopped beef, which was tender and savory. The pulled pork was delicate and moist while the sausage was a tad too greasy. For sides, we went for the chipotle slaw and pinto beans. The sugar-free, perfectly spiced slaw was the best coleslaw we’ve had in years. These gals know how to make the real thing. On our second attempt at Micklethwait Craft Meats, we didn’t leave it to chance. We got there by 12:30 pm to wait in line. Fortunately, our friend Taiss and new Austinite showed up 15 minutes earlier, waiting patiently for us. Standing by the huge pit, we waited to order at the trailer window, where a short menu with fine products hangs. Brisket, pork ribs and sausages, we had enough stomach to share all the meats available. Tom Micklethwait, the owner, started the barbecue trailer in 2012 after a career in bakery. The brioche-like light and slightly puffed bread tasted like it had been kneaded tenderly by a baker’s experienced hands. Making everything from scratch including the bread, Tom mastered the art of Texas barbecue in a few short years. Since 2017, Micklethwait Craft Meats has been on every Texas awarded list for the best barbecue plate in Austin. The meat here can be ordered by the plate as well as by the pound. Claire and I shared a three-meat plate with brisket, pork ribs, and a Tex-Czech sausage. To go along with the meats, we chose the coleslaw and beans. We found the brisket a bit fatty for our tastes and while the pork ribs were tasty, we relished the sausages. The Tex-Czech sausages were the best we had on our quest. The meat and fat were perfectly balanced, the filling moist and the skin crisp. The lemon poppy-seed slaw was a nice surprise. The refreshing lemony flavor slaw and poppy seeds added crunch to the texture. 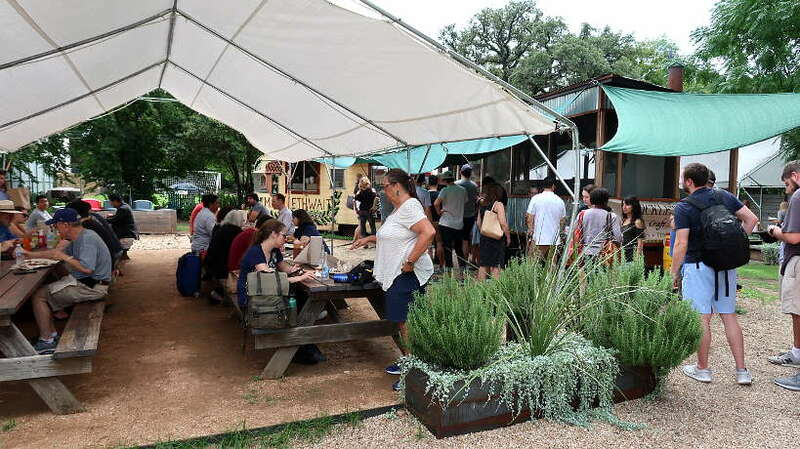 From the modest trailer, Micklethwait Craft Meats offers an outstanding alternative to the long lines at Franklin’s barbecue. The outdoor seating area is filled with Texas flowers and shrubs. It’s a relaxing place to savor the flavors under the canopy. Visiting local farmers markets is one of the best ways to learn about the local food culture. 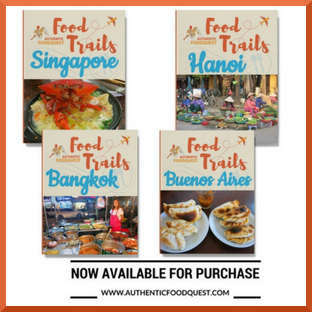 Whether we are in Bangkok, Santiago, Chile or Los Angeles, local markets always yield surprising discoveries. One Sunday, while exploring the Texas Farmers Market at Mueller, we unexpectedly discovered what became our favorite Austin barbecue. The Mueller Market, as it’s commonly known, is a local favorite. Surrounded by plenty of green space, including a lake park, you’ll find a number of vendors and food stalls. From fresh vegetables, Texas honey and bread, farm-raised beef, pork, and eggs, there is plenty to choose from. Local artisans making kombucha, artisanal olive oil, honey wine, and other organic craft products are all around. As we made our way to the far end of the market, we noticed this one stall with a consistent queue. Taking our line in place under the simple Mum Foods sign, we waited patiently to sample their meats. Truth be told, we went to Mum Foods twice. Our first visit was at the end of our first week in Austin. We ordered their smoked wagyu brisket, which we immediately fell in love with. Falling apart in our hands, the meat can eaten without a fork and knife. We loved Mum Foods so much that we went back at the end of our quest to try it again and confirm if it was still our best barbecue in Austin. This time, in addition to the smoked wagyu brisket, we had their award-winning pastrami and co-owner, Geoffrey generously threw in some ribs. The barbecue sells out at the market and for good reason. The brisket had just the right amount of fat and was dripping in its juices. 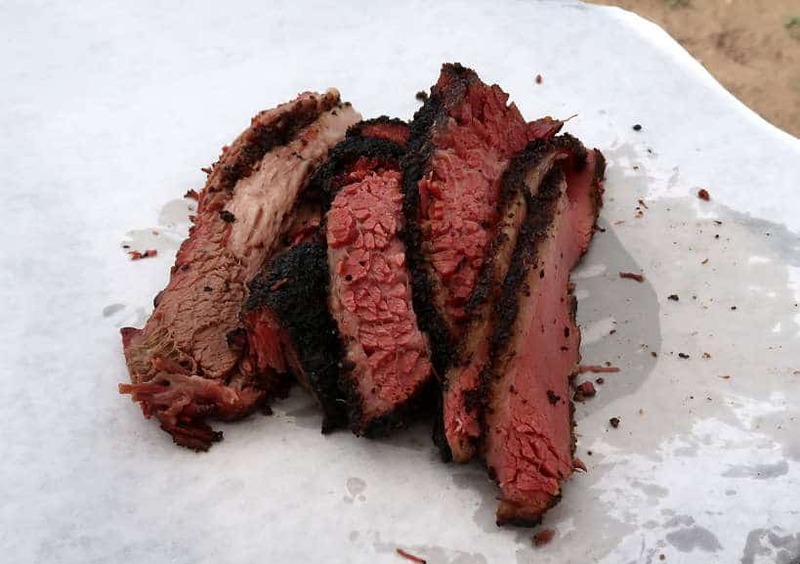 The pastrami, with the perfect amount of seasoning, every bite is a trip to barbecue heaven. The beef brisket ribs were tender and simply, perfect. Everything we had was consistently good. Valentina’s is in Austin, though we visited it on our way to Lockhart. On the quest for the best barbecue in Austin, we could not miss this local gem renowned for its Tex-Mex Barbecue. Tex-Mex is a fusion of Mexican and American cuisine that can be found across the U.S. but primarily in Texas. 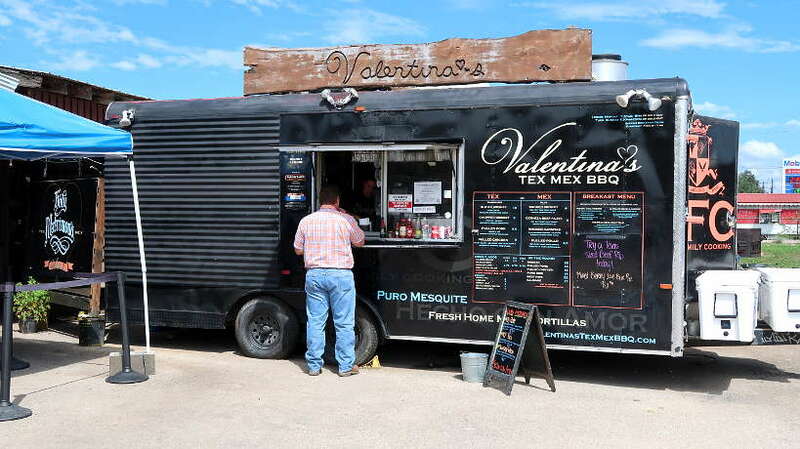 Valentina’s Tex-Mex BBQ trailer is about 15 miles south of downtown Austin. A family business, they have been opened since 2013. Every year brings more praise and recognition for their Tex-Mex barbecue flavors. 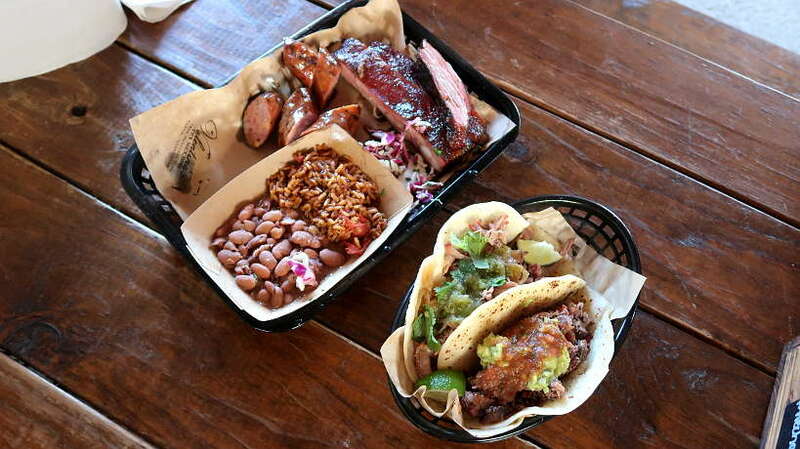 With a menu that offers part Texas barbecue and part tacos, we chose to taste both. We ordered a plate with pork ribs and jalapeno cheddar sausage served with rice and beans. An order of smoked brisket and smoked carnitas tacos completed our order. Although we joyfully dove into the ribs, our favorites were the tacos and especially the brisket taco. The brisket was incredibly tasty and well seasoned. Served with homemade salsa, guacamole, and flour tortillas, we had our mouths full. The jalapeno cheddar sausage just wasn’t for us. We felt the addition of cheddar cheese to the sausage took away from the experience. Nevertheless, the tacos stuffed with barbecue smoked meats more than made up for the experience. Having eaten our way through some of the local barbecue spots in Austin, we decided to explore even further, and go to Lockhart, the Barbecue Capital of Texas. 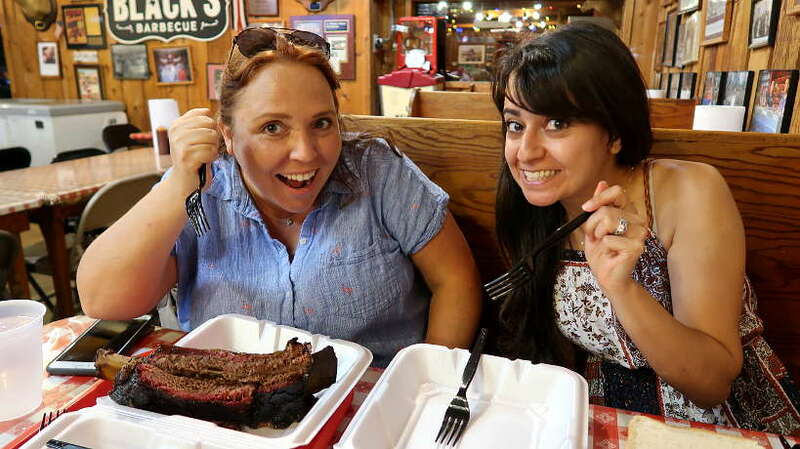 In the company of our friends, Maria, from EuropeUpClose and Taiss, from TogethertoWherever, we made the all girls trip to Lockhart in search for the best barbecue in Texas. The trip to Lockhart, about 35 miles, southeast of Austin, was an all day affair, filled with adventure and barbecue. 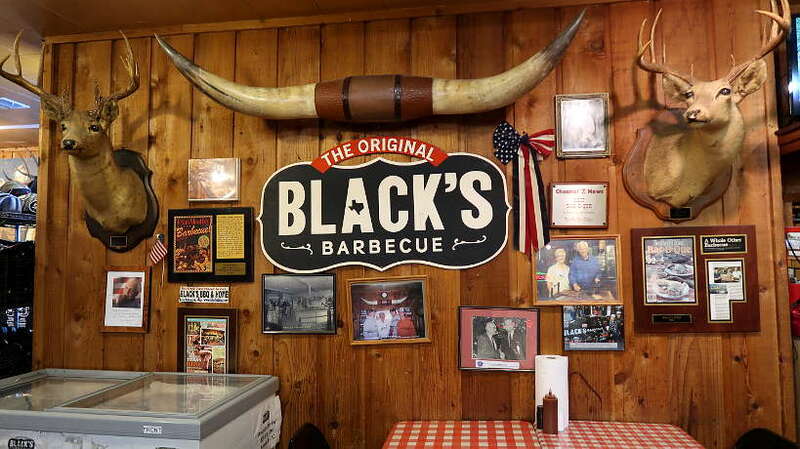 After a first stop at Valentina’s Tex-Mex barbecue, we went to Black’s Barbecue, the oldest family-owned barbecue restaurants in the state of Texas, since 1932. We got there right after the peak lunch period and there was no wait. The larger than life sign by the entrance with the words “Giant Beef Ribs” greets you as you walk in. Right at the entrance is a cafeteria style counter where you order your sides and desserts first. 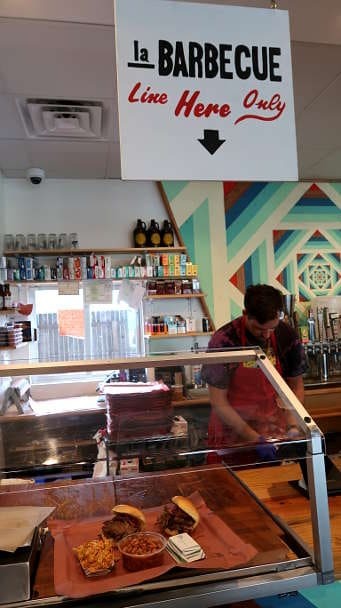 You then make your way to the butcher block where you can choose brisket, beef ribs and sausages. Knowing we had to pace ourselves for a full day of barbecue eating, we decided to share one Black’s giant beef rib, one sausage ring and split the beans and coleslaw sides. The gigantic beef ribs at Black’s can range from under one pound to nearly two pounds. Our rib was a little over one pound and was just enough. The restaurant is steeped in tradition with an old-time decor. Picture wood paneled walls, horns of various sizes adorning the walls, signs for high school sports teams, and plastic red & white checked tablecloths. A nostalgic atmosphere. The Black’s beef rib is a carnivore’s dream. A generous slab of pink meat, with blackened edges hugs a nine-inch rib bone. We enjoyed the tender meat, but would have welcomed a little more flavor to the crusted edges. Black’s sausage links had a nice bite to them with a peppery finish. The filling was tasty with the right amount of fat though they could have been a bit more meaty. The sides, beans and coleslaw, were prepared in a traditional manner. None was exceptional in any way. Not our favorite, they were fitting of this legendary Texas barbecue restaurant. A trip to Black’s in Lockhart TX, is an experience. An irrefutable rite of passage for barbecue lovers. When they say giant, they mean it! 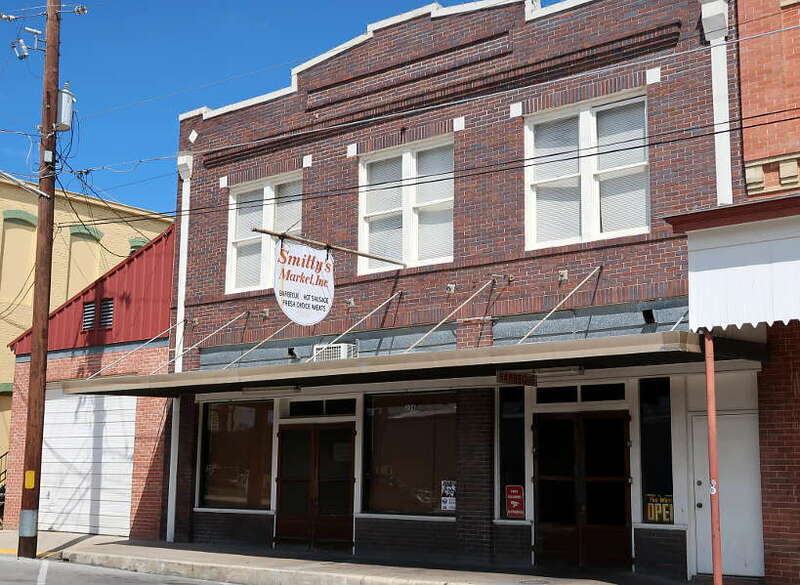 Smitty’s Market, another Lockhart barbecue heavyweight can be found on Commerce street in the walkable downtown Lockhart area. Too stuffed and with no plans of eating at Smitty’s, we took a quick tour of the place to see this slice of history. The entrance, a long hallway with darkened walls, leads to a pit with light from a menacing open fire. The smell of wood burning accompanies you until you get to the butcher block were you order your meats. 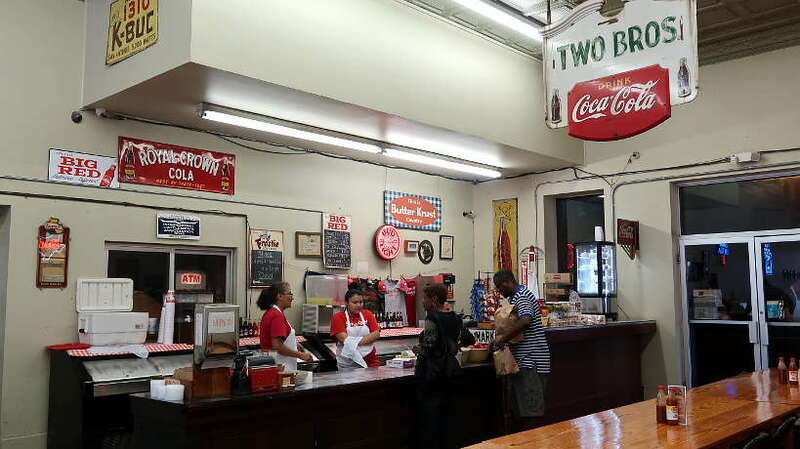 The location opened around 1900 as Kreuz Market, a German butcher shop that sold fresh meat during the week and smoked the leftovers on the weekends. In 1999, a feud between a sister and her brothers, caused the brothers to move Kreuz Market to a new building on the northern outskirts of town. Fortunately, the sister, Nina Schmidt Sells and her son, John Fullilove re-opened the space, under the Smitty name in honor of her father, Edgar “Smitty” Schmidt. The menu consists of brisket, pork ribs and chops, shoulder clod, prime rib and pit-cooked sausages. You pretty much line, up, place your order by the pound and pay by cash or check (no debit or credit). 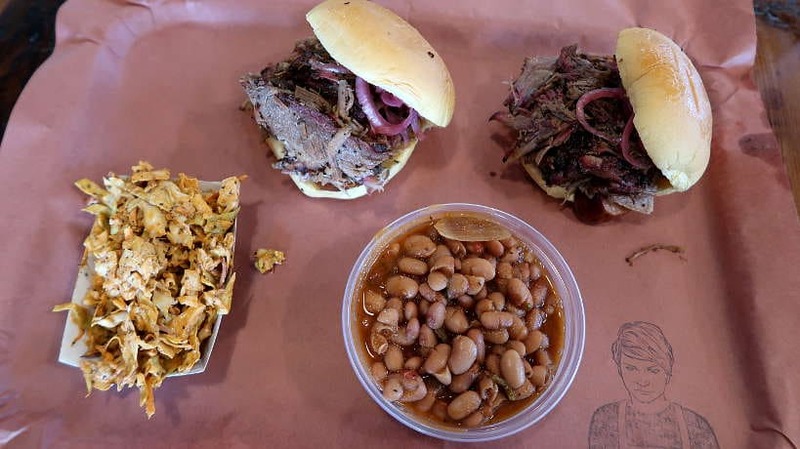 Everything is served to you on butcher paper; there are no plates, no forks, you eat with your hands. While we didn’t eat here, we would definitely not miss it the next time we are in Lockhart. If you’re travels take you to the area don’t hesitate to stop by this classic spot filled with character and tradition. For the last stop of the day, we took the 45 minute drive from Lockhart to Driftwood to go the acclaimed Salt Lick BBQ. We deliberately made this our last stop so that we could enjoy the beautiful setting of the Texas Hill Country. Knowing that Salt Lick BBQ is BYOB, we stopped along the way to pick up beer. The place is sprawling with even a winery on site. 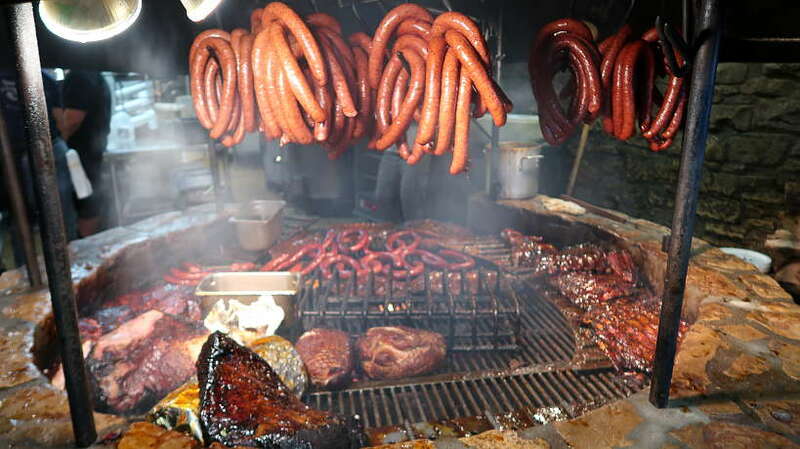 Upon entering The Salt Lick, you can’t resist the “Texas-sized grill” piled high with all kinds of meats and sausages. Not only are your eyes captivated, your nose is enraptured in delicious barbecue smells. After getting seated, ordering was hard. We were all pretty stuffed, yet we wanted to savor the Salt Lick barbecue flavors. Founded in 1967, Salt Lick grew from just a pit by the road into a massive operation with multiple locations. After discussing, the menu, we went for the “Thurman’s Choice” combo, which came with brisket, pork ribs and sausage. Along with that, we ordered a serving of pulled pork. To complete the meat dishes, two sides came highly recommended. The vinegar slaw sprinkled with black sesame seeds and the mayo-free potato salad with celery seed. We also ordered desserts. In general, the meats were solid, juicy and with just the right amount of smoke. While the meats were flavorful, the sides and desserts were excellent. Just the right amount of sesame and celery seeds elevated the sides from just average to delightful. The homemade pecan pie and the half & half blackberry and peach cobbler pie were favorites at the table. Claire, in particular, devoured the pecan pie, while the rest of us enjoyed the tasty and not so sweet cobbler combo. 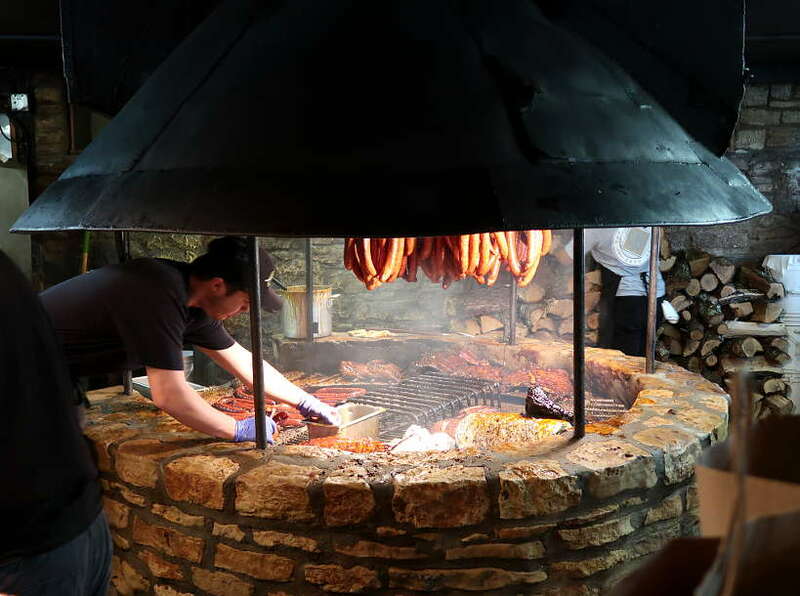 Visiting Salt Lick is an experience to have while in Austin. The scenic drive, BYOB policy, and gorgeous setting makes it worth the trek. For recipes and more about the family tradition at Salt Lick, pick up the book, The Salt Lick Cookbook: A Story of Land, Family, and Love. Chisholm Trail in Lockhart is another local favorite which has been providing exceptional barbecue since 1978. While we didn’t eat there, locals tells us it is worth putting on the map. This quest for the best barbecue in Austin gave us a unique insight to the local barbecue scene. The subtleties in taste and the craft needed to achieve perfection for the brisket, sausage or ribs was an eye-opener. We learned to trust our own tastes and not be swayed by the “best of” or “top barbecue in Austin” type lists. 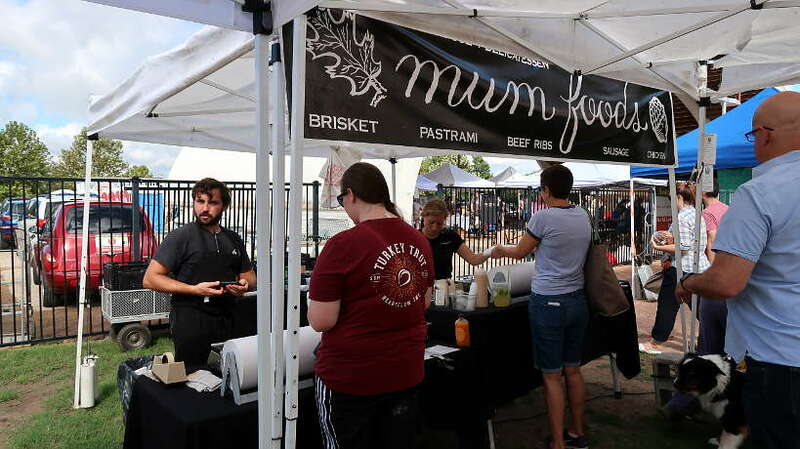 While we enjoyed the meats at most of the barbecue spots we visited, our favorite barbecue in Austin was from Mum Foods, a place we rarely saw on the popular top lists. Most importantly, we came away with a new appreciation for Texas barbecue. The transformation that occurs when meat is cooked with simple ingredients and long hours at the pit. In a land where everything is bigger, so are the portions. Take a hearty appetite on as you seek out your best barbecue in Austin. And be prepared, as we found in our case, to loosen a notch or two on your belts. To follow this quest, simply click on any of the pictures and view the map for directions. Trover, is this handy app that lets you connect with other travelers through beautiful photos and shared stories. This article was written in collaboration with Trover. WOW!!! Amazing food! I will have to go back to some of those and also check out the ones I haven’t been to yet-got my work cut out for me! Oh, and I should probably take Rob, too!HA! Thanks so much for the mention! It was a great time exploring Austin’s BBQ food scene with “YA’LL” 🙂 P.S. 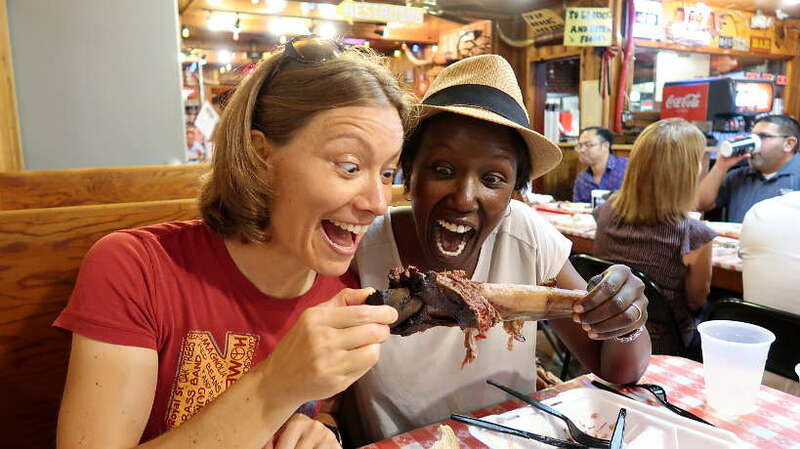 I love the pic of you two with the giant rib! Thank you for being a wonderful “stomach” on this quest for the best barbecue in Austin. Check out the other spots and let us know what you think. Thanks, Taiss!! My mouth is literally watering reading this! I can’t imagine a much better place to have a bbq and the portions must be huge!! Woah Rosemary! That is a whole lot of meat! How long did you spend on this quest? You must have been soooo full after a few days of that much meaty-goodness!! I am also really drawn to the tasty photos of slaw and beans…they looks sooo good! Fortunately, Josy, we had a whole month to spread out the meat eating goodness 🙂 The sides were pretty good and perfect to go with the meats. A lot of eating and a lot of fun!! That’s funny, Mark…lol!! Totally agree. In the end, you’ve got to make up your mind and your own opinions. The adventure is half the fun. 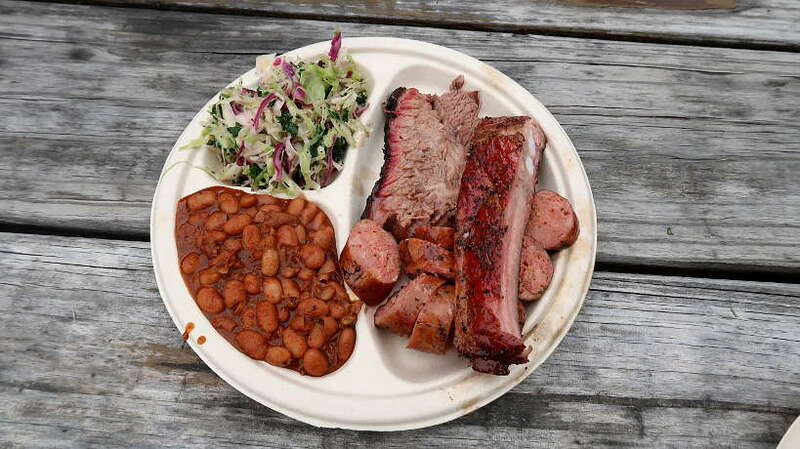 If you haven’t made it to Austin for the bbq yet, definitively consider a trip! Cheers. I’ve been itching to get to Texas to try some BBQ. It was interesting to hear about how Texas barbecue came about and what makes it different from other styles of barbecue. Glad you enjoyed the article, Erin. Get to TX as soon as you can, it is worth it! Thanks for stopping by. OMG I’m seriously dying for some home cooking right now! Next time I’m in Texas I’m going to head to these spots! Brittany, When you do get to check out the spots, please let us know what you thought. Thanks for the stopping by. Nothing beats Texan barbecue! Your photos make me drool. I am officially missing Texas. Maybe I’ll visit again! So many great ideas! I have never been to Texas, but have heard many great things about their barbecue scene. You tried a whole lot of it! Would love to try the infamous TEX MEX in texas one day. But for now, I’ll have to settle for my family’s Mexican food from MEXICO and California. But you really did go all out here didn’t you? So many Texan culinary options. Really quite a roundup for the foodie loooooovers!! Cheers! Thanks and so glad you enjoyed the article. The Tex Mex barbecue was one of our favorites for sure. Hope you get to Texas soon and experience it for yourself. Appreciate you stopping by! As a BBQ lover, I’d be totally up for this quest, and I can’t think of a better place to do it than Austin. Loved that you included how it came to the area. I had no idea. Thanks for all the great tips and honesty. Makes me want some BBQ pork ribs right now! Thank you Lara and so glad you enjoyed the article. Good to know this quest is right up your alley. We’ll definitively invite you the next time we are doing “part 2” of this quest. We’re missing the bbq as well. Thanks for your feedback and for stopping by. Cheers. 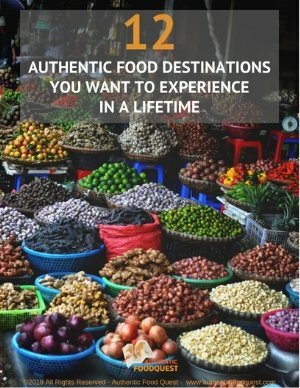 I cannot wait for my Austin foodie trip- thank you for putting this guide together, not just with the best restaurants but also so much history! I didn’t know that BBQ styles can go even by region in Texas before your post (I guess it makes sense- it’s so big! ), and I’m excited to try Central Texas BBQ! Thank you Angelica and glad you enjoyed reading about the history of barbecue in Texas. 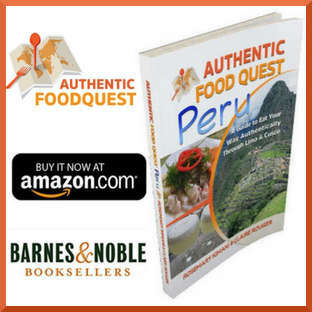 It certainly helps when we understand the cultural context of the food. When is your Austin foodie trip? Do let us know what you find. Thanks for stopping by. I have not yet been to Texas but a friend of mine is getting married there in December. It’s my goal to be able to go, so if I get the chance to hang out in Austin I am definitely going to check out the places you listed! While it seems crazy people wait up to 6 hours for barbecue, there must be a good reason huh? 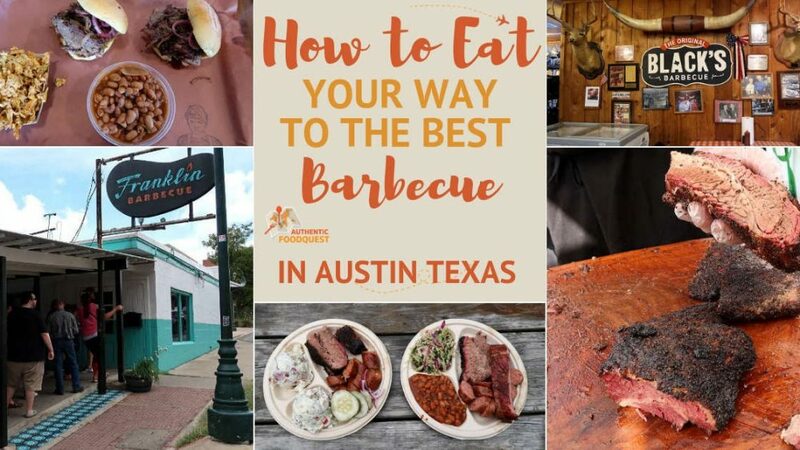 Thank you for this in depth guide to barbecue in Austin! I’ll be saving it for later! You will have a wonderful time in Texas in December. Do hit up as many places as you can from this list…and let us know your favorite. Have fun and start salivating. The barbecue is worth it 🙂 Cheers. Wow!! In love with all things meat right now! 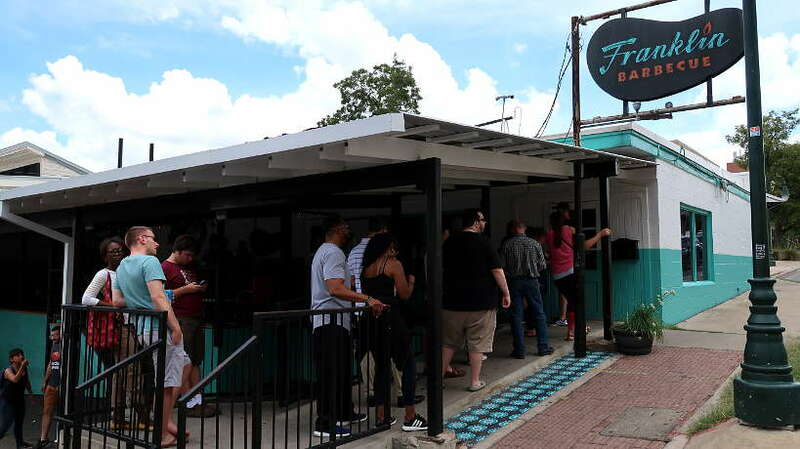 😀 I cannot believe that people wait for up to 6 hours at Franklin Barbecue – I get that it’s the best in the world but woah! Haha, luckily you did not wait that long. 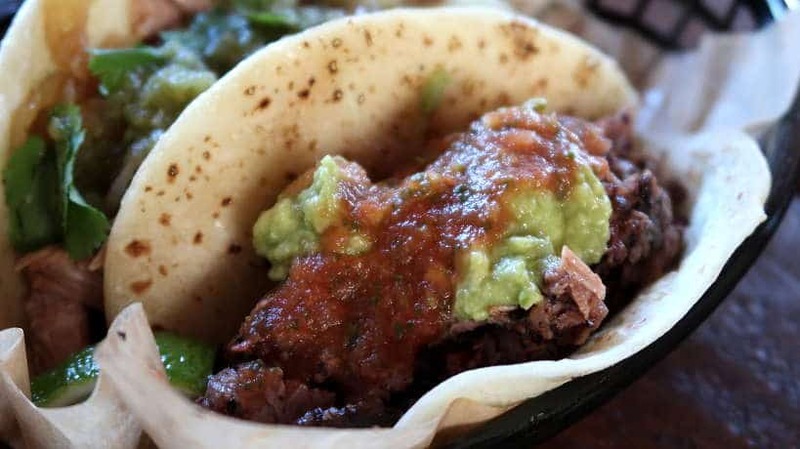 Tex-mex sounds like my kinda food, the brisket taco looks absolutely delicious! This is a great post, thanks for sharing! So glad you enjoyed the article Lisa. The barbecue in Austin is quite an experience. 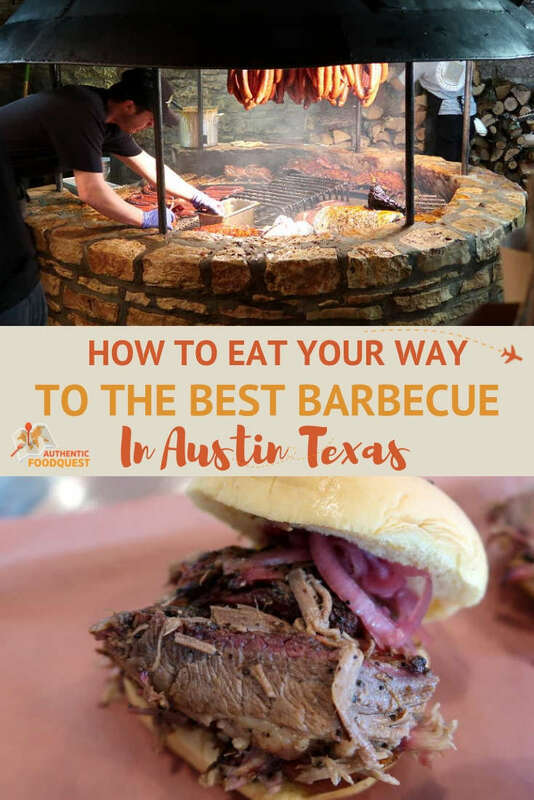 There are many options for amazing barbecue in Austin and most do not require a 6 hour wait…even though it was quite good! We also really enjoyed the Tex Mex flavors. It was a first for us and we look forward to more. Hope your travels take you to Austin soon. Thanks for stopping by! We totally agree, there is no food that is worth a 6 wait 🙂 Glad you liked the look of Mum Foods. All their meats are to die for. Send your son over to TX for a barbecue feast galore. Thanks for stopping by. I went to Cooper’s Old Time Pit Barbeque during Travelcon. It was dang good. I spent extra time exploring Austin with my vegan friends. Your post makes me wish I at more meat. Franklin’s looks like it was totally worth the wait. Glad to hear that Cooper’s was pretty good. The name came up a couple of times in our search as well. Franklin’s barbecue was good. Worth the 40 minute wait indeed…now 6 hours, never!! Amazing guys. I had Texas BBQ during a wedding in Pennsylvania last year. Genius couple hired a Texas BBQ truck to drive up and serve wedding guests behind the hall. Divine food. Melts in your mouth. Wow, what a great idea to send up TX barbecue for the wedding. The Central Texas style of barbecue is so unique that I can see why the couple did that. It truly does melt in the mouth! Thanks, Ryan. Can you believe I lived in Texas for 5 years and traveled to Austin a few times, but never actually had barbecue in Austin? I’ll admit, it’s not really my favorite food. However, I do like that the Texas style is less saucy. Like you guys, I prefer for the meat to have all the flavor. Next time I’m in Austin I’ll make sure to finally have some barbecue. Can’t believe you missed out on barbecue in Austin. It’s worth another trip to Austin for sure 🙂 The focus on the meat and less on the sauce makes it worth it. Do let us know where you end up trying when you eventually make it back to Austin. Thanks, Vicky. Ooh! That looks like a meat fiesta! This post is making me hungry. I would love to try them all, but the Martin’s Potato Bun especially looks amazing! Gotta bring my appetite. Wise words….on a trip to Austin, you definitely bring your appetite with you. Cheers. This is great – this will be us in a few years when we visit Texas for the solar eclipse (2024)! I love ribs, so that is always my go-to, but it would be interesting to try the sausage and pork too. Love the look of those giant beef ribs. But would definitely try Mum Foods – that pastrami looks out of this world. I think it’s important to try those places that aren’t necessarily on the big lists! You are so right, Hannah, many of the gems are often not the popular list. The owners of Mum Foods are so friendly and accommodating as well. You’ll get great service and great food 🙂 Keep this post handy for your future trip to Texas. Thanks, Hannah. Thanks Mansoureh…so glad you enjoyed the article and the video. Truly, farmers markets are gems that are often overlooked! Thanks for stopping by. Hey Rosemary, thanks for such a great BBQ guide, it made me feel really hungry! Here in Europe it starts to be Fashion with all the Food trucks, but in Austin they seem to be popular already. All the food Looks really yummy. You are right Veronika, food trucks are already popular in the Austin. The cuisines at different food trucks varies but the experience is unique. Hope you get breakfast tacos to Europe soon. Amazing!! Whoa! Sounds like a perfect haven for barbecue lovers. All the places you mention look great and the food is so tempting. Just wondering about the calories now.